Tempest Williams plans to use the land to promote "Keep It in the Ground" movement decrying fossil fuels. 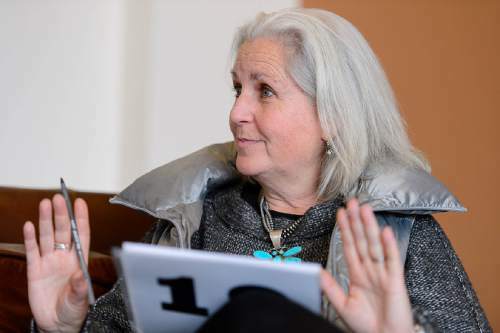 Trent Nelson | The Salt Lake Tribune Utah author Terry Tempest Williams announced her departure from the University of Utah last week after contentious contract negotiations with administrators who insisted she teach on campus rather than in the field. She is pictured here Feb. 16 shortly after buying a BLM oil and gas lease near Arches National Park as a gesture of protest against fossil energy development. Williams had planned to teach her U. Environmental Humanities students on this federal parcel as part of her Art, Advocacy and Landscapes course. 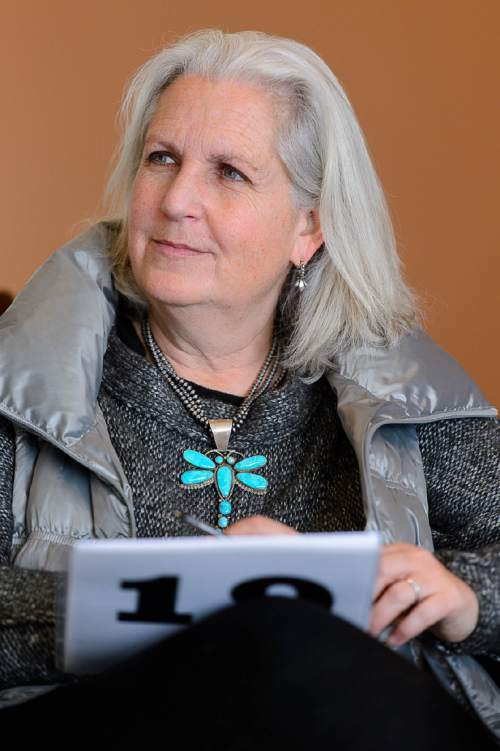 Trent Nelson | The Salt Lake Tribune Utah author Terry Tempest Williams announced her departure from the University of Utah last week after contentious contract negotiations with administrators who insisted she teach on campus rather than in the field. She is pictured here Feb. 16 shortly after buying a BLM oil and gas lease near Arches National Park as a gesture of protest against fossil energy development. Williams had planned to teach her U. Environmental Humanities students on this federal parcel as part of her Art, Advocacy and Landscapes course. 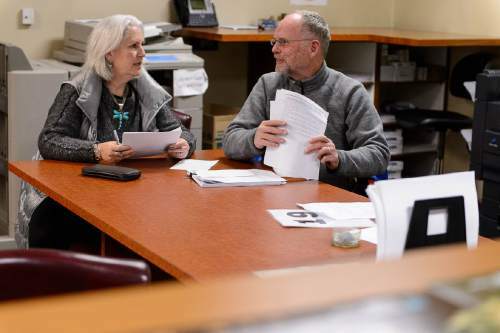 Trent Nelson | The Salt Lake Tribune Terry Tempest Williams (holding her bidding number) and Brooke Williams in the BLM's Salt Lake City office, Tuesday February 16, 2016. National protesters mobbed a routine oil & gas lease auction Tuesday at the Salt Palace, where Tempest Williams tried to bid on parcels with the hopes of keeping them from being drilled. She ended up submitting an offer after the auction on a parcel that failed to attract the minimum $2-an-acre bid. Trent Nelson | The Salt Lake Tribune Terry Tempest Williams in the lobby of the building housing the BLM's Salt Lake City office on Tuesday, Feb. 16, 2016. Moments later she and a Tribune reporter and photographer were ordered by Gateway Security to leave the property. National protesters mobbed a routine oil & gas lease auction Tuesday at the Salt Palace, where Tempest Williams tried to bid on parcels with the hopes of keeping them from being drilled. She ended up submitting an offer after the auction on a parcel that failed to attract the minimum $2-an-acre bid. 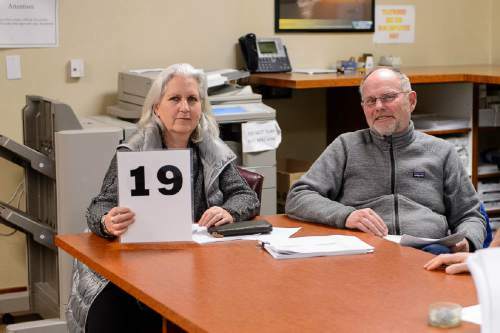 Trent Nelson | The Salt Lake Tribune Author Terry Tempest Williams with her bidding number in the BLM's Salt Lake City office, Tuesday February 16, 2016. National protesters mobbed a routine oil & gas lease auction Tuesday at the Salt Palace, where Tempest Williams tried to bid on parcels with the hopes of keeping them from being drilled. She ended up submitting an offer after the auction on a parcel that failed to attract the minimum $2-an-acre bid. Trent Nelson | The Salt Lake Tribune Terry Tempest Williams and Brooke Williams in the BLM's Salt Lake City office on Tuesday, Feb. 16, 2016. National protesters mobbed a routine oil & gas lease auction Tuesday at the Salt Palace, where Tempest Williams tried to bid on parcels with the hopes of keeping them from being drilled. She ended up submitting an offer after the auction on a parcel that failed to attract the minimum $2-an-acre bid. What would have been a routine federal oil and gas lease auction on Tuesday became a stage for climate activists clamoring for an end to fossil fuel development on public lands, as well as a chance for Utah author Terry Tempest Williams and her husband, Brooke, to get into the "energy development" business. Tempest Williams attended the auction in support of Elders Rising, Canyon Country Rising Tide and other protest groups with the hopes of bidding on parcels in Grand County, but she wound up agreeing to buy one for $1,200 without bidding  which could have landed her in prison if she could not afford to actually pay for it. The Williamses acquired a lease on hundreds of acres near their Castle Valley home, a parcel that had not attracted the minimum $2-an-acre bid. All they had to do was head over to the Bureau of Land Management&apos;s Salt Lake City headquarters after the auction. Ordinarily, parcels that fail to sell can be purchased over the counter at fire-sale prices. "What was so devastating was to witness on the centennial of our national parks that lands adjacent to Arches National Park are being sold for $2 an acre, and after the fact $1.50. These are America&apos;s public lands that are being sold for less than a cup of coffee," said Tempest Williams, a writer revered for her poetic meditations on the interconnections between natural landscapes and the human spirit. 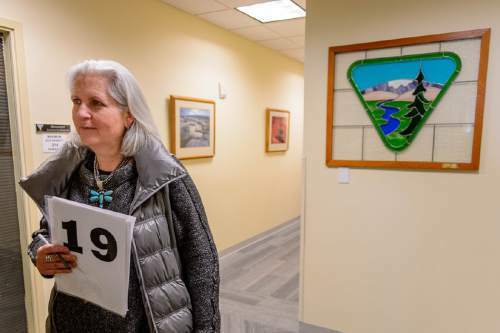 Wielding a card designating her as Bidder 19, Tempest Williams was front and center Tuesday as the BLM solicited competitive bids to drilling rights on 46 parcels in Utah&apos;s Canyon Country, Green River and West Desert districts, and the Fishlake National Forest. "Two federal agents came over and said, &apos;Are you a legitimate bidder? If this fraudulent, you will go to prison,&apos; " Tempest Williams said. "We all know what happened to Tim." She was referring to activist Tim DeChristopher, who spent 21 months in federal prison for monkey-wrenching a 2008 auction with bogus bids. Unlike DeChristopher, the Williamses intended to actually pay for the leases, then develop them for a different kind of energy. "You cannot define our definition of energy," Tempest Williams said. The energy development we are interested in is fueling the movement of Keep It in the Ground," a growing movement pressuring the BLM and other federal agencies to cease allowing the extraction of oil, gas and coal on millions of acres of public land in Utah and other Western states. "So we appear to have [a parcel several miles northwest of] Arches, and I can&apos;t wait to get our students on that land and see what we can develop," said Tempest Williams, who teaches in a graduate program at the University of Utah. "Our next class in environmental humanities will be on this oil and gas leasing, and we will be fueling our energy as a movement." The Williamses plan to launch a company called Tempest Exploration that will manage this BLM lease and others they intend to acquire in the future. On the block Tuesday were 45,000 acres, but acceptable bids were offered on 21 parcels covering 22,771 acres during the auction at the Salt Palace Convention Center. The BLM&apos;s total haul for the auction was $278,000, a meager sum compared with the agency&apos;s past Utah auctions. Turner Petroleum of South Jordan turned in the largest bid  $120,000  for a 160-acre parcel in the Uinta Basin. At times, bidding was disrupted by protesters chanting "Keep it in the ground." "It distracted the auctioneer, and bidders complained that they couldn&apos;t concentrate. I informed them they could sing for another 60 seconds, which they did, and one of the gentlemen quieted them down," said Kent Hoffman, the BLM&apos;s deputy state director over lands and minerals. When the chanting resumed, Hoffman cleared the hall. No arrests were made, and Hoffman emphasized the entire episode was peaceful with no animosity. Protesters have targeted most of the BLM&apos;s auctions in Western states in recent months as a way to draw attention to the role fossil fuels play in disrupting global climate systems. As much as a third of the nation&apos;s hydrocarbon wealth is under public lands. Most of Tuesday&apos;s leases were originally set to be auctioned in November, but the BLM postponed that sale at the last minute when it was clear that the auction room at its Salt Lake City headquarters could not accommodate all the people interested in attending. Officials combined those parcels with those set for the next quarterly auction and selected the Salt Palace as a substitute venue. The BLM has discretion over which parcels to lease for oil and gas development and can attach any number of stipulations to protect nonenergy resources, such as sensitive plants and endangered wildlife. But the federal agencies cannot legally make all the lands they administer off limits to energy extraction, according to Hoffman. "We have a robust process for legal and environmental review," Hoffman said. "I like to follow the rule of law. If you look at the stats, we have deferred the vast majority of parcels nominated for lease for the past several years and put the rest through tough scrutiny. We are following the process. When we are offering something for energy development, we believe it&apos;s in the best interest of the country." When oil and gas companies lease public land, they are purchasing rights to extract as long as they begin producing within 10 years, though lease suspensions are routinely granted. Anyone can buy a BLM lease as long they are a U.S. citizen older than 18 and have no outstanding debts to the federal government. The Williamses said they respect the BLM&apos;s obligations and their real argument is with federal lawmakers. "I feel empathy and respect for BLM employees who are just doing their jobs. What we have to look at is Congress and how they view public land," Tempest Williams told The Tribune in the lobby of the BLM&apos;s headquarters in The Gateway mall. "This is the open space of democracy. We will be purchasing more oil and gas leases under Tempest Exploration. I would encourage other citizens who care about public lands to purchase these [leases] and hold them." At this point in the interview, Gateway security officers insisted that the Williamses and two Tribune journalists leave. They pressed the issue even as the Williamses objected and then engaged in pleasantries with BLM agent Dan Love, who happened to be passing through on his way to the elevator. "It&apos;s not a public space. It is private property," an officer said. Also participating in Tuesday&apos;s protest at the Salt Palace were the Center for Biological Diversity, First UU Environmental Ministry, Great Old Broads for Wilderness, Living Rivers, the Mormon Environmental Stewardship Alliance, Rainforest Action Network, Science & Environmental Health Network, Women&apos;s Congress for Future Generations, the Sierra Club, Utah Moms for Clean Air, Utah Physicians for a Healthy Environment, Utahns for Bernie Sanders and WildEarth Guardians. The groups contend that extracting and burning the hydrocarbons harbored in the Utah leases would release up to 1.9 million tons of greenhouse gas pollution. Activists say the United States needs to wean itself from fossil fuels to avert a global climate catastrophe. Presidential candidate Bernie Sanders, an independent senator from Vermont, is sponsoring legislation that would end fossil fuel leasing on federally managed lands and cancel nonproducing leases. President Barack Obama has already imposed a moratorium on new coal leasing. The BLM&apos;s next Utah auction is May 17. The energy industry has derided the Keep It in the Ground protests as meaningless political theater. "It&apos;s much more fun to wave protest banners and shout rehearsed chants than to actually provide reasoned arguments," wrote Aaron Johnson, spokesman for the Western Energy Alliance, in a blog post that compares protesters&apos; antics with "Breaking Bad" character Saul Goodman. "It&apos;s clear from their actions they have no scruples. They&apos;re willing to stage stunts and have little regard for meaningful engagement on policy issues. When it comes to national energy policy, they&apos;re as credible as a TV conman." Brian Maffly covers public lands for Salt Lake Tribune. Maffly can be reached at bmaffly@sltrib.com or 801-257-8713.